This July EMI’s Insight division launched an unprecedented initiative to share data from their 850,000 interview Global Consumer Insight data. This dataset covers 25 countries and over 7,400 artists, with twelve people being interviewed at any given moment, 24 hours a day, 7 days a week. The data is being shared with the data science community in a range of initiatives including forthcoming Music Data Science Hackcamps. As hard data continues to be something of a scarce commodity for the streaming music debate I decided to mine EMI’s dataset to create a snapshot of global streaming music adoption, and its influence on the broader music market. I have written up a report which you can download for free here. Additionally EMI have given me permission to post the data here so that you can play around the data yourselves. In fact I invite you to go and play around with the data and see if you can find any trends that I missed in my analysis. Streaming has a firm foothold. 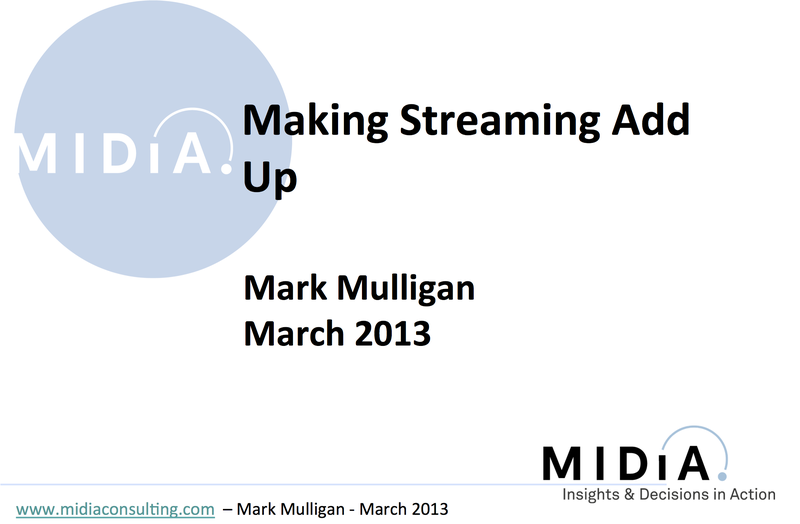 32% of consumers across the globe are now using streaming services (see figure 1). However, adoption is far from uniform. Nordics lead the way. Norway and Sweden (the home of Spotify) are respectively the 1st and 3rd most active streaming markets globally. Key to this trend is the relative sophistication of Internet users in these markets. 48% of Norwegians are now streaming music users, as are 43% of Swedes. Streaming is a good fit for piracy riddled Spain. Spain is the 2nd most active market with 44% streaming penetration. But whereas consumer sophistication was key to Nordic adoption, in Spain piracy and the legacy of free were the most important drivers. Free is a good fit for France too. The role of piracy and free have also been important in France. French authorities have pushed through the controversial Hadopi legislation but the carrot of Spotify and local streaming success Deezer has delivered immediate results. Translating streaming usage into purchases though is less successful: just 13%. Purchase conversion rates are higher in lower penetration markets. The US, Canada, UK, Germany and Denmark have lower streaming penetration but these markets have much higher streaming-to-paid downloads conversion rates, averaging 23% of streaming users. Streaming Drives Music Discovery and Consumption. Although it is still too early to draw definitive conclusions about exactly how much streaming impacts piracy and sales, the case for driving discovery and consumption is much clearer. 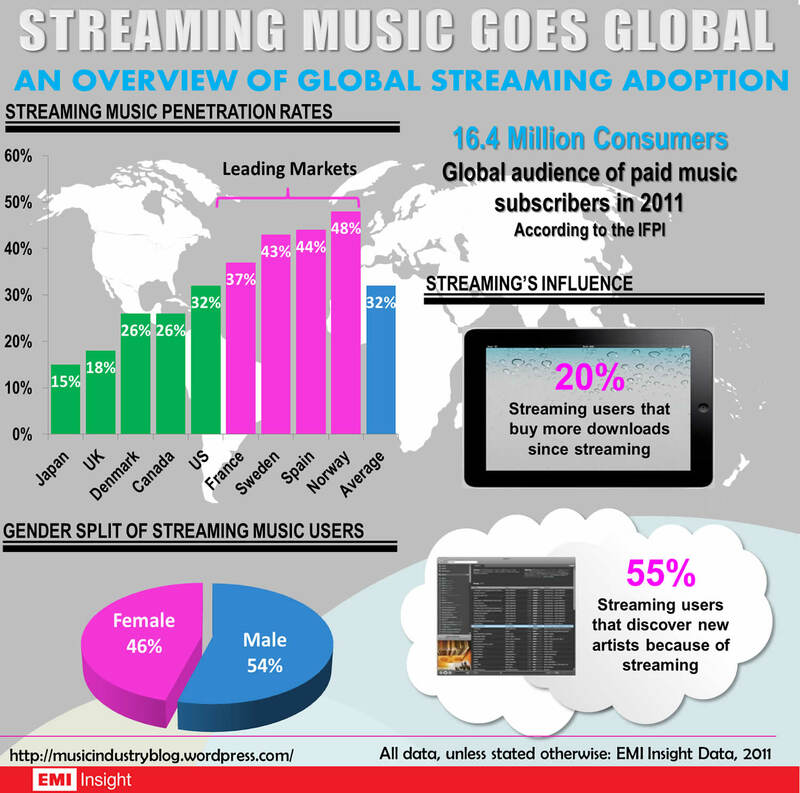 55% of global streaming music users state that they now discover new artists and new music as a result of streaming. Usage is steady among existing users. Usage among existing streaming users is broadly steady with 19% using streaming more than 12 months previously and 20% more. The music industry needs innovation more than most industries and yet the last two years has seen a slowdown in the number of new licensed music services coming to market and greater consolidation around the Triple A of Apple, Android and Amazon. In this brave new world music start-ups need an entirely new modus operandi. There are many reasons for the slowdown in new licensed music services, but a key one is the establishment of the license-advance business model in which record labels issue licenses only upon payment of sizeable, non-repayable advances in anticipation of forecasted income. Depending on the scale of the risk to the labels presented by the licensed service these payments can range from relatively modest to downright gargantuan (Beyond Oblivion went to the wall owing $100m to Sony and Warner Music even though not a single consumer ever saw the service). With so few services managing to make a dent on Apple’s market share investors have grown wary of investing in music start-ups that require licenses, some have effectively stopped investing in them all together. The labels’ focus on partners with scale (and effectively using advances as means of sorting the financially robust wheat from the chaff) may deliver near-term security for the labels but it increases their long term risk by slowing music service innovation. Hungry young start-ups are often more likely to create transformational innovation than heavily resourced R&D divisions of billion dollar companies. Thinking ‘out of the box’ is always a lot easier when you’re not actually in the box in the first place. The status quo is a lose-lose for all parties, each of whom find themselves stuck in a Catch 22: labels need new services but also the safety net of advances, services need licenses but can’t pay for the advances and investors want to invest in music services but won’t do so when advances are required. It is time to change the model, for this cycle of insufficient innovation and market contraction to be broken. Record labels – become investment partners: Record labels – majors and independents alike – deserve great credit for transforming their business in the last few years, but they cannot change the market alone. Labels need to harness open innovation, leveraging the developer ecosystem. OpenEMI is an early model of best practice but to fulfil its massive potential the approach needs underpinning with a more equitable alignment of label-developer relationships. Start-ups are going to help solve record labels’ problem and labels need to not just tap that expertise but accelerate it. To do that record labels need to apply A&R rules to technology start-ups. On the artist front labels already behave like Venture Capital firms, now they need to translate this appetite for risk to their commercial strategy. To take the same sort of risks on start-ups as they do on artists. This of course means that labels will routinely require equity stakes – and sizeable ones, but instead of just being a licensing requirement, these will be in return for a new relationship in which labels establish nurturing partnerships with young start-ups, just like those they have with artists. When a start-up is at pre-launch stage it is probably going to be more appropriate to take a good chunk of equity for licenses than it is an advance that the start-up can ill afford. Of course it will still be appropriate for advances to be part of the mix in some circumstances – sometimes even the majority of the mix – but the balance of the relationship should be investing to become a business partner. This means becoming active stakeholders, sitting on boards, working with the entrepreneurs to help make them successes. In short, the relationship should change from licensee-licensor to investment partners with shared vision and motives for success. Start-ups – understand what labels need: Though record labels are becoming increasingly confident of their own innovation capabilities, no media company is an innovation agency while technology start-ups have innovation imperatives at their core. Unfortunately they often get the conversations with labels wrong. Instead of going to labels with the “we’re going to save your industry” pitch, start-ups should better understand what label priorities are and then propose working with them to help them achieve those objectives, as partners. (This is something that Spotify did incredibly well right from the start). Just as it is best practice to engage with an investor long before they actually need money, start-ups should apply the same approach to record labels. Investors – work with labels as partners and embrace the API economy. Investors might have some reservations about working with record labels at start-up board level but they shouldn’t fear losing influence. The odds are investors will still make the same scale of Seed and Series A investments, it is just that their money will be working smarter, helping build great technology and hiring better people at those crucial early stages of a company’s life. Investors and labels often find themselves on opposite sides of the argument. There is no inherent reason the relationship should be adversarial. Investors should also think about how well their investment strategy harnesses the capabilities of the API Economy. Of course it is always preferable to invest in a business that owns all of the fuel that powers its engine. 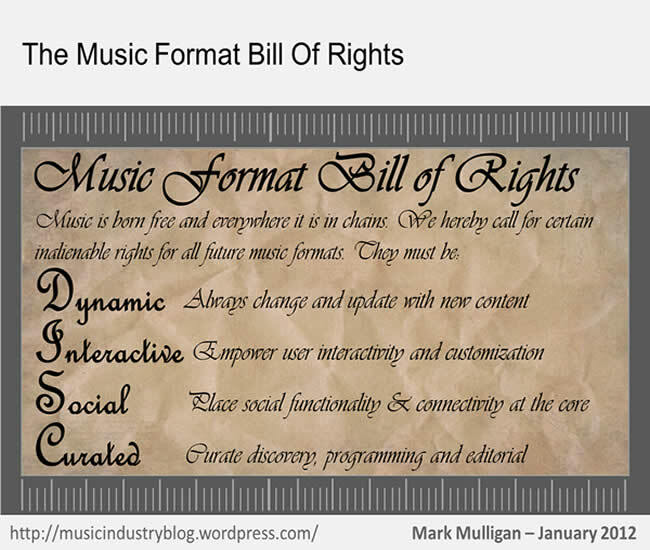 But in the era of integrated music API’s it is no longer crucial for a music service to have its own licenses. An investor wouldn’t expect a mobile app developer to own Android, iOS or Windows Mobile so they need not expect a music service to own music licenses. Some of these changes are already beginning to happen, others are a long way off from being realized. But this change is needed to enable to next wave of transformational innovation that the music industry so desperately needs. Freeing up precious and scarce early stage resources leaves start-ups able to focus on developing great, innovative technology. Which in turn will mean better products, better user experiences and more revenue for everyone. I first discussed some of the themes covered in this blog post in the Giga Om Pro report ‘Monetizing Music in the Post-Scarcity Age’ which can be found here. Congratulations on your successful bid for EMI. You are about to find yourself in charge of an unprecedentedly large share of the world’s music market. Not so long ago, to have even imagined that regulators would countenance such a situation would have been fantasy. But the world has changed, and I’m sure you’ll be glad that Prime Minister Monti will be too preoccupied with cleaning up Silvio Berlusconi’s mess to block another EMI acquisition (though time will soon tell whether Joaquín Almunia will be any more understanding, or indeed if he intends to carry on Neellie Kroes’s crusading). For argument’s sake, let’s assume that the acquisition clears all regulatory hurdles and challenges. You now control more than a third of the recorded music market. And although some suggest that market share doesn’t matter anymore, I just don’t buy it. In fact I think market share matters more than ever and I think you do to. Of course, in pure business terms market share on its own means nothing. Revenue pays the bills, not market share. And yet, in the digital arena, market share takes on a whole new meaning. Because you and your label peers still exercise an effective monopoly of supply of content to digital services, whoever holds the largest market share holds the greatest degree of market control and can thus shape the market. Now, as head of an even bigger ‘world’s biggest record label’ I’d love to watch you oversee a stepping-up of this approach. And I’m not even too bothered about you charging a premium for being the first to license. (Between you and I, that’s because I’m waiting for market dynamics to balance things out, for your bold licensing strategy to pull the rest of the marketplace with you, and to such an extent that all of the majors will be fighting to be the first to license to the next disruptive service. So that nobody will be able to charge a premium for being first anymore. I guess when it comes down to it, I’m hoping your exercising of seller-control will paradoxically create a buyers’ market. But I can keep a secret if you can). And while we’re talking, what I’d like to see less of, is using the justification of ‘risk mitigation’ as a means of stifling the market. Yes, all majors demand big fat advances from digital services, and yes, it does a great job of separating the wheat from the chaff, of ensuring the market is driven by serious companies with serious scale. But, as much as the prospect of the digital market evenly split between the Triple A of Apple, Amazon and Android may be more palatable to you than one in which Apple controls 75%+, you don’t really want that any more than I do. As pesky and unpredictable as those small disruptive start-ups can be, they are the ones which ultimately drive the quantum leaps in digital music progression. If young start-ups have to commit the majority of their investment to label advances, that means that they will have so much less to spend on technology development and marketing. Which of course means that you end up with safely secured digital income but no great new services driving the market forward. Have you stopped to wonder why there has been a slowdown in licensed digital music services? VCs are getting tired of financing non-starters. Why am I firing this broadside at you when all of your major label peers are just as guilty? Because now as head of the world’s biggest ever ‘world’s biggest record label’ I think it is only right that you start using your power to drive change across the entire market. Your company has done so well in the digital arena by being bold, ambitious and, most importantly of all, by being innovative. I’ve long held Universal up as the innovation standard for traditional media companies of all shapes and kinds. But there comes a point at which that innovation must focus on providing the necessary conditions for driving innovation in the marketplace. In short, I am asking you to continue to be a catalyst for innovation across the digital music marketplace, but also to resist succumbing to the conservatism and caution that your unprecedented market share will undoubtedly tempt you with. Be bold, be brave, take risks (big risks) and most importantly of all, use your new power responsibly, don’t give the sceptics ammunition. The digital music market needs Universal Music to continue to drive innovation not stagnation. Following on from Part 1 of the ‘Innovation Files’ series, this post looks at EMI’s OpenEMI initiative and how it could drive transformational innovation within the major record label and publisher. EMI today announced an interesting developer initiative that aims to revolutionize the way in which developers work with EMI. Securing licenses from record labels is a notoriously resource intensive and time consuming process that can leave some apps still born: many smaller developers – especially the one man outfits – often simply can’t spare the resources, time (and money) that can be required. To streamline the process EMI have inserted themselves directly into the developer value chain. They have partnered with the Echo Nest to build a ‘sandbox’ where developers can access a repository of continually updated EMI content including music, videos and artwork. Developers need only sign up to EMI’s API to start working with the assets. Developers can either proactively develop their own ideas or respond to briefs and requests sent from EMI, who will funnel combined requests from artists, managers and labels. Developers however do not get to simply build Apps using EMI’s content and then go take them to market. Instead every app requires EMI approval, and EMI hopes to encourage best practice of developers submitting requests as early in the process as possible. Clearly not all apps will get approved and there is certainly potential for log jams. However the process will most likely streamline organically – assuming all partners have the right attitude and willingness to be sufficiently agile. It will also be a great platform for all the extra content that 360 artist deals now deliver and that major labels too often just aren’t utilizing well enough. Although initially this set up will principally act as an innovative alternative vehicle for sourcing artist apps – with developers playing around with EMI’s APIs replacing the traditional tender and quote process – it has much bigger longer term potential. The name EMI has given this initiative speaks volumes: OpenEM. It is a statement of intent. Even though what we will see in this initial phase is relatively modest, it takes huge amount for an organization like EMI to take what is for them such a radical approach to their content. More importantly I expect this to be an opening salvo in a broader strategic move. EMI have not just built an API framework for developers, they have built an API for their own future innovation. The challenge for EMI is the degree to which they can fully harness this new innovation toolset and respond to the new approaches and mindsets it will require. OpenEMI is a brave step that has the necessary senior executive support to be a success. To help ensure success, OpenEMI’s champions will need to win support across all levels of the organization, and to do that they will need to demonstrate clear benefits to the most sceptical of opponents. Transformational innovation is never easy to implement because its path is littered with the corpses of the products, processes and jobs associated with the old ways of doing things. But it is exactly this difficult path that all media companies must take if they are to emerge intact out of this unprecedented period of disruption. The Terra Firma debacle was an unfortunate distraction for EMI at exactly the time they didn’t need it, leaving them at distinct market disadvantage. They need an unfair advantage to start re-levelling the playing field. Driving transformational innovation through the entire organization, commercial partner relationships, artist relationships and product strategy is the fuel for that advantage. If harnessed to its full potential OpenEMI can be the first step on that tricky path. The UK music industry and ISPs have been working towards the goals of the government-brokered Memorandum of Understanding since last summer but we’ve yet to see concrete results, in particular with regards to new music offerings. All stakeholders recognize the crucial importance of having a big fat carrot to accompany the stick. Yet we still seem to be some distance from the ISPs being empowered with truly compelling music services they can offer to their subscribers as a genuine alternative to file sharing. On the surface of things this week’s reported tie up with Sky and Omnifone for a music subscription services seemed like a positive step forward. However, the lightest of scratches beneath the surface reveal it to actually be a microcosm of broader problems. Omnifone’s press announcement pointedly doesn’t even mention Sky as a partner for their new ISP white label offering. Although many press reports imply Sky have signed up, the only actual substance is that Sky are considering using Omnifone to power some of the technology on its offering. The nuanced specifics here are important. Last year Sky and Universal Music proudly announced a music JV. Details were scarce in the extreme but the strategic ambition was bold. Sky has since then not been able to add any of the other 3 majors onto the JV roster. Part of this may well relate to the other majors getting increasingly narked about UMG’s highly proactive (even aggressive) digital strategy. But more broadly it talks to the fact that there is a lot of distance between what Sky wants to be able to offer its customers and what the labels feel they can provide for the financial terms Sky are willing to consider. This follows on the heels of Virgin Media dropping pursuit of PlayLouder’s MSP offering due to label concerns and also 7Digital so far failing to get any ISP to take up their white label offering. The root of the problem is that the ISPs want to offer consumers more content and flexibility for less money (and pay the labels less) than the labels are willing to countenance. Apple changed the rules of the game and the failings of the ISP services were only accentuated. The ISPs know now that if they get back in the game they have to be differentiated and be able to compete with Apple. But they also know that most of their file sharing subscribers are unlikely to be able or willing to pay much either. So the ISPs want compelling (ideally MP3) services that cost little or nothing to consumers. The labels business models can’t support that model without the ISPs picking up a lot of the cost, which they can’t afford to do due to falling broadband ARPU. A series of Joint Ventures: MySpace have created a blue print for using this approach to get favourable licensing terms to deliver free music that wouldn’t have been financially viable otherwise. And the labels get lots of potential upside and to extend their role in the value chain. JVs would bind the ISPs and labels closer together, create common purpose and engender greater strategic flexibility. Time is of the essence: every day that goes by, file sharing grows in popularity and becomes more entrenched. So agreeing on intermediate solutions with a view to a longer term roadmap is far favourable to stalling until the perfect solution can be agreed upon.